12 Days of Christmas: Day 9 - Mexican Loteria Pillow Set! - Fueled by chile, frijoles & tortillas. 12 Days of Christmas: Day 9 – Mexican Loteria Pillow Set! Sometimes, things just work out when you least expect them to. That’s really what happened with today’s Day 9 giveaway for the 12 Days of Christmas. I was hoping to include something beautiful and handmade in this special Christmas series, and just like that California-based artist Andrea “Dia” Misuraca reached out to us and offered to make that happen. Andrea runs an online store by the name of Pillow & Pocket, and these gorgeous pieces are part of her amazing collection. 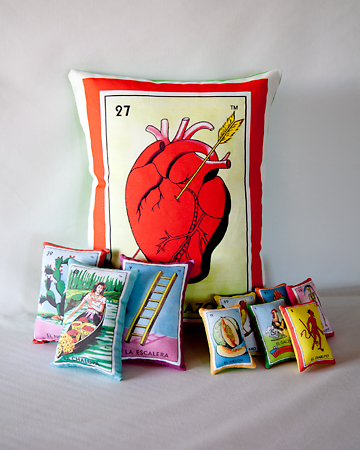 You all know how much I love Loteria, and these pillows are just beautiful! I want them for my house. To the lucky winner, please enjoy them as much as we would! You must enter on or before 11:59 p.m. on Thursday, December 12, 2013 for your chance to win. I will announce the winner here on this blog post by Friday, December 13, 2013. 12 Days of Christmas – Day 8: A Holiday Feast for your Familia, in Texas! 12 Days of Christmas: Day 10 – Makeup & more Makeup from CoverGirl! Great for the Christmas Tree Decor. Like the Drunken Man. My Son like the Mermaid. I could really use one of these for the bed in my college dorm. Also you wouldn’t happen to have a spare mattress lying around. Would you? But these do look like realllllly comfy. ¡Me gusta mucho! Estas piezas son muy hermosas. Loteria decoration theme!!! These are awesome!!! Love these! 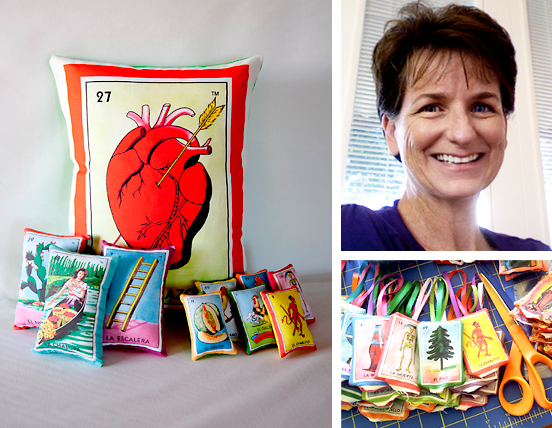 Loteria art is a favorite and the pillows and ornaments seen here are perfection! I must have them!!! They are way cool and need to be in my house! Lovely pillows! La Loteria es uno mis juegos favoritos, me encantan! They are,perronsicimas y super divertidas! !me encantan! I have friends that I would love to gift these to! They are just as obsessed as you guys. What a great idea! These pillows are beautiful. Loteria!!!! These are absolutamente lo mejor! I still remember playing lotería with my family in Monterrey, N.L., or with the vecinos in San Antonio, TX. Instead of cards, the neighbors fashioned wooden coin chips with numbers on them. The caller had memorized all the cards and, using an empty gallon, would shuffle them, pour one out, and call the card based on the number on the chip. You knew there was a winner when one of us yelled, “¡Buenas!” I can’t believe I still remember those details. Awesome idea! I know right where they’d look great in my house! These would make a nice gift for myself. I have a spot on my tree just waiting for the ornaments! Que expresión y combinación de arte y cultura! Metiches! I live for Loteria everything!! Choose me, Universe!!! I was actually trying to paint and do my own Loteria pillows.. I would love to win some to complete a set! Love love love them! Wow!! This are super cool! Espero ganar! Saludos para tu familia, desde La Villita, Chicago. Too cool!!!!! I can make frijoles strings instead of popcorn to go with the loteria ornaments!!!!! ♥♥♥♥♥ the loteria set!!!!! My girls and I would LOVE this!!!! They always want to play Lotteria! no manches! These are awesome!!! Please enter me for the Lotteria pillow giveaway! I LOVE THEM !! Beautiful!! We played loteria all the time with all our primos! These are amazingly gorgeous and creative!! Handmade xmas presents are awesome. I plan to make some hand bound notebooks to give away. Hope I can win these! ¡Me encantan! These will look great in my home. These pillows remind me so much of Mexico and its colorful culture. They would make a great addition to my home decor! Congrats Briselda, you won this awesome pillow set 🙂 Please check your inbox for details on how to claim your prize, and please enjoy them! issue. Seriously.. thank you for starting this up. This site is something that is required on the internet, someone with a little originality!